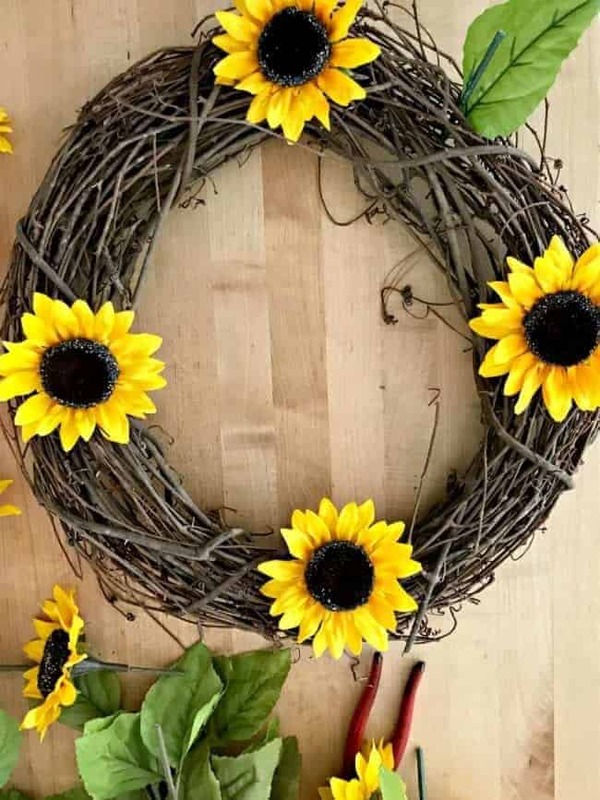 How to make a sunflower wreath in under 30 minutes. 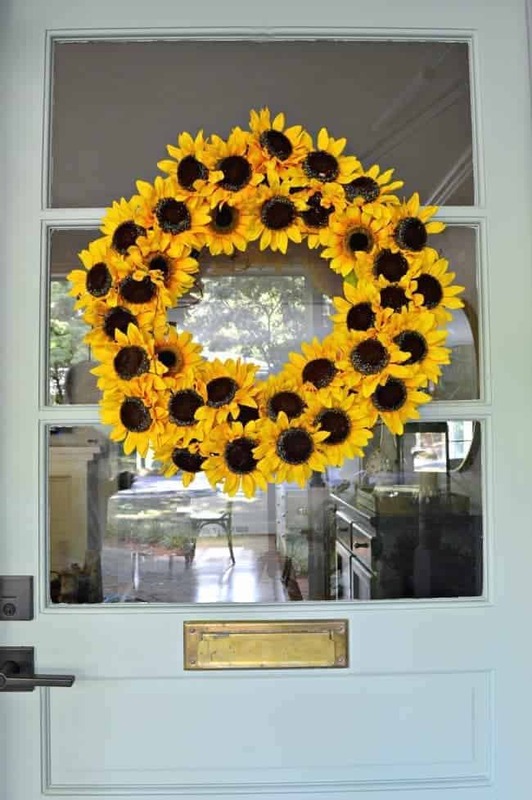 I wasn’t going to do a wreath for the summer but my bare front door was calling out for something…anything. Instead of sticking a few flowers in my hanging basket, I decided to add some flowers to a grapevine wreath. I actually took this idea from my spring tulip wreath, that I made a few months ago, and tweaked it a bit. Remember that one? It was big and bold and all kinds of pink. The hubs wasn’t crazy about it but I loved it. Just like the tulip wreath, I wanted this to be quick and simple. 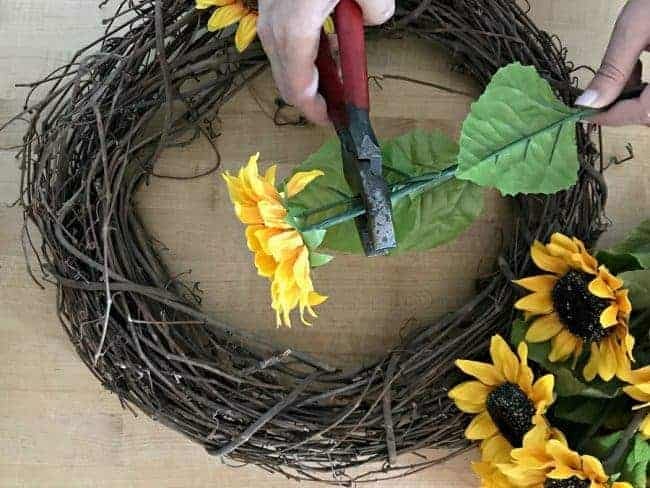 So, in order to do that I used just a few supplies..sunflowers and a grapevine wreath. That’s it! 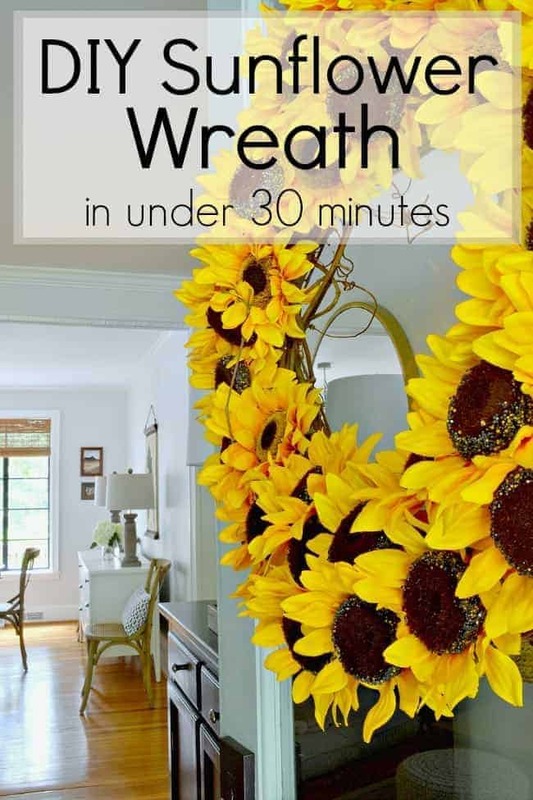 Really, this is one of the quickest and easiest front door wreath crafts ever. 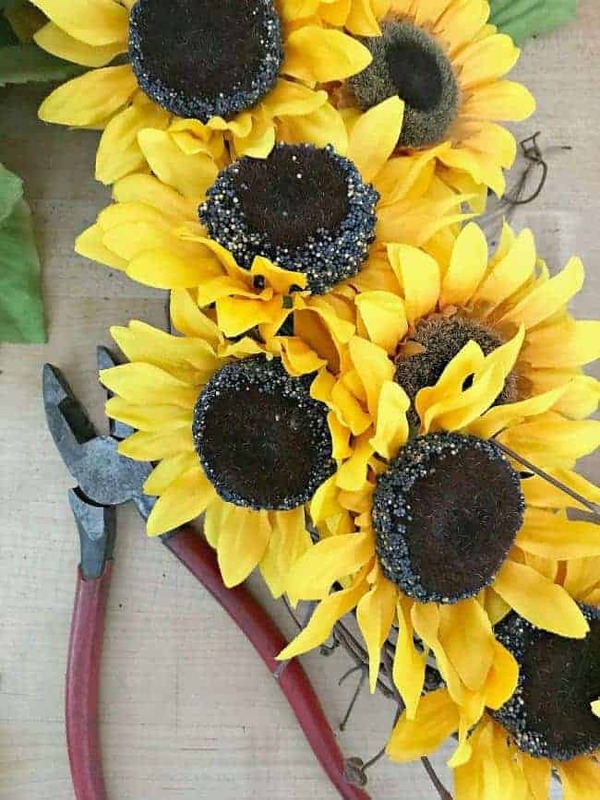 First, I used the wire cutters to cut most of the stem off each sunflower, leaving enough so that I could push them through the grapevine wreath and bend them over (about 6″). Once the stems were all cut down, I started assembling my wreath. I placed 4 flowers equidistant from each other and then filled in the empty spaces. Easy peasy! 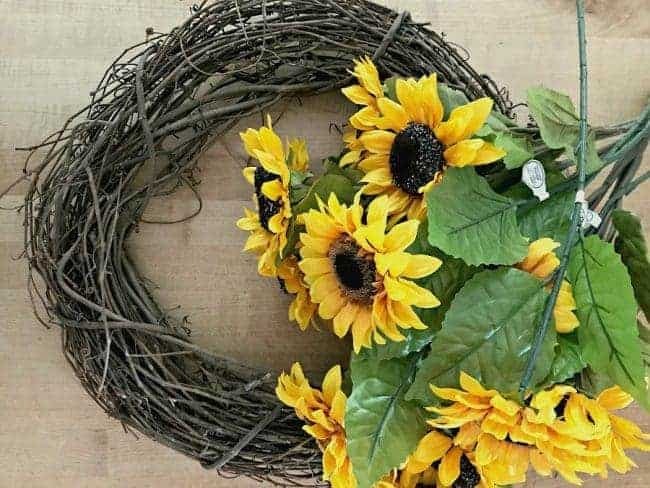 In under 30 minutes I have a simple sunflower wreath for my front door. I’m loving the yellow of the sunflowers with the blue on my farmhouse front door. 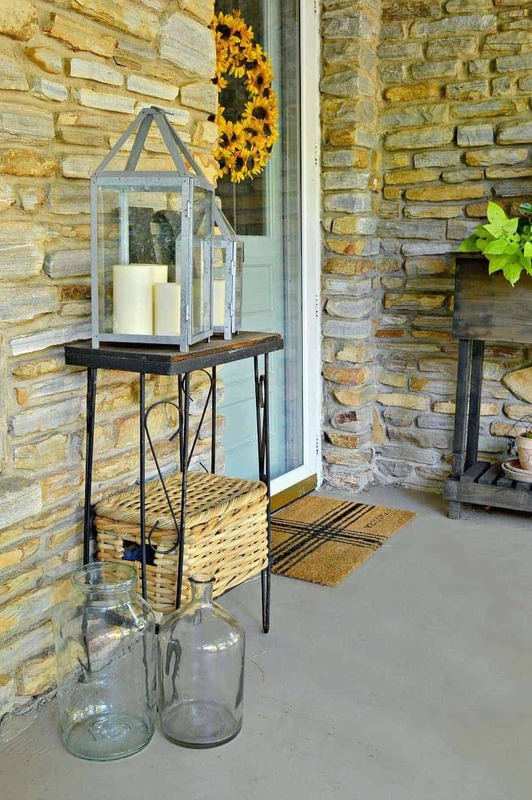 It’s the perfect touch for my summer front porch! Beautiful! Sunflowers are one of my favorites! Very pretty! Perfect for summer…. Looks nice and summery, I loved your tulip wreath too. It looks like the back of the wreath can be seen from inside – did you finish off the back in any way? Thanks Sheila! 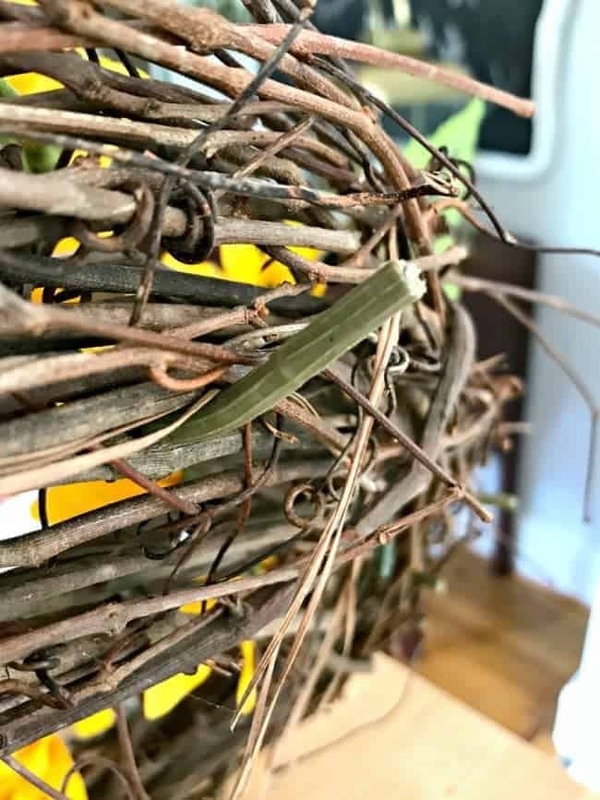 Yes, you can see the back of the wreath from inside but the sunflower stems really blend in with grapevine so I left it go. 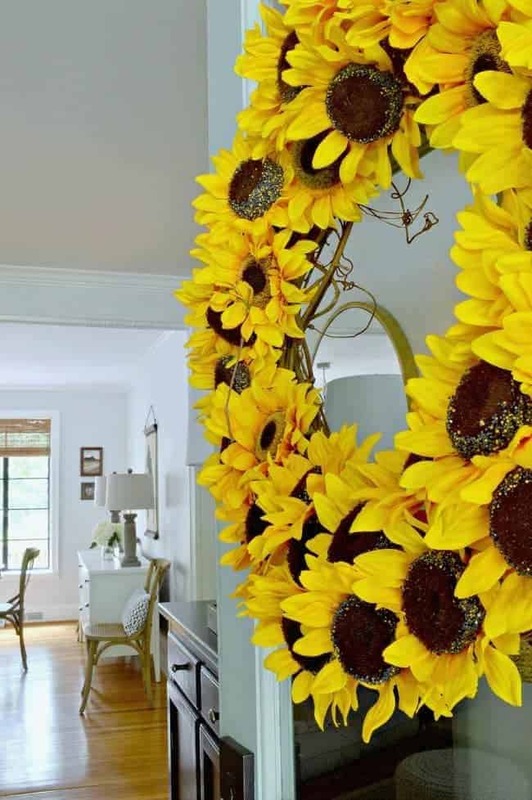 I loce sunflowers and your wreath looks just perfect on your fabulous door! 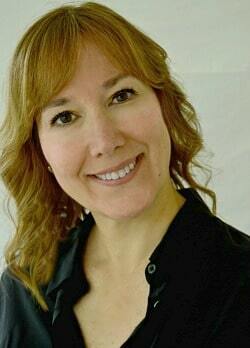 Another hit Kristi. So bright and happy. Does the hubs like this one better? Thanks Debbie! I agree it is a happy color. 🙂 And, yes…hubs likes this one a whole lot more than the pink. I found this basket at Pottery Barn. I think they still have them in stock. Hope that helps.